Bathroom floor tiles come in a variety of materials, sizes and designs, each suitable for a different setting. The bathroom tiles may be made out of porcelain, ceramic, vinyl and what not. The tiles have remained the most popular and the most practicable choice when it comes to bathroom flooring. There are many different types of tiles available in the market suiting different requirements and aesthetics. 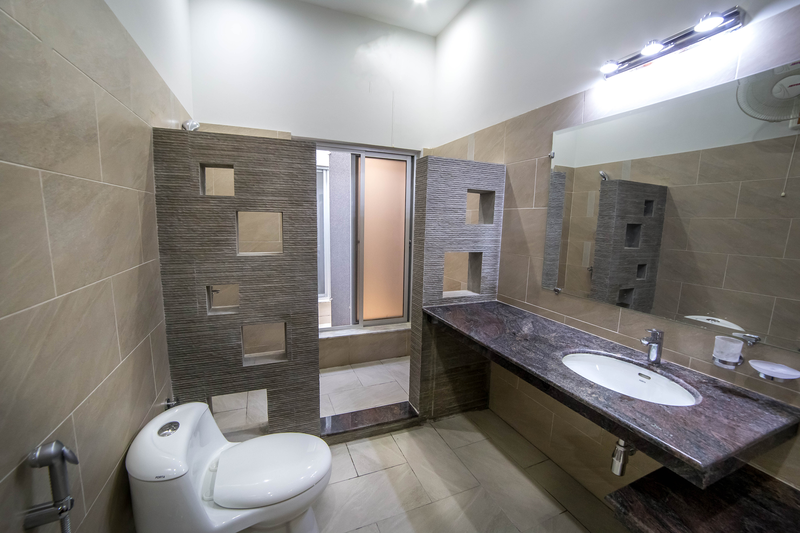 AmerAdnan®, the Asia Pacific Award winning interior decorator in Lahore also recommends making use of tiles in the bathrooms instead of choosing any other kind of flooring. With the advent of many new types of tiles made from wood, cork, stone, glass and a lot more, you can choose the tile that best satisfies your aesthetics and your bathroom’s theme. Please read below about the types of tiles you can find in the modern day and about how each of these tiles can be beneficial for you. As the name clearly suggests, these tiles are manufactured by heating, shaping and cooling natural minerals and clay. The ceramic tiles come in a number of designs and styles in many different sizes to suit different needs. They also come in different colors, textures and finishes to help you transforming your bathroom into a welcoming part of your house. With this kind of limestone, your bathroom can get a classic look. The travertine tiles are a byproduct of hot springs from across the world. The travertine has all the minerals mixed together forming up a whole new and unique design pattern. The travertine tiles are preferred by many homeowners and interior designers all over the world. 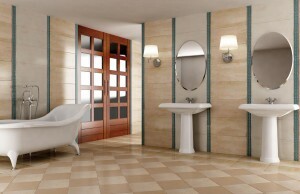 The tiles for bathroom made out of porcelain are one of the most preferred choices. The porcelain is manufactured out of natural clay when it is exposed to extremely high temperature. Porcelain tiles are perfect for both indoor as well as outdoor usage. They are available in a number of textures, sizes and colors to suit different requirements. Manufactured and textured just like the real wood, these tiles are gaining high popularity in the modern era. The wood-like tiles also known as the faux wood tiles, apart from the elegance of wood, provide great warmth and feel of nature. Since natural wood cannot be used as bathroom tile, a faux wood tile gives its true feel. The slate is a metamorphic rock that is preferred at bathrooms, kitchens and many other places across the home. The slate tiles come in many different colors including the copper, red, navy, sage, tan, black and many more. These tiles are recommended by a number of interior designers in Pakistan for bathroom décor needs. For all those who are looking for something sturdy and long-wearing, there are marble tiles. The durable marble stone comes in a plethora of colors which is why many people prefer marble tiles. These are polished to ensure great finish and fall in the category of the most popular types of bathroom flooring.